A simple script that names selected objects based on a packed object's name to make them into collision shells for use in UE4! All the selected meshes are named correctly and will import into UE4 as collision shells! I tried to make it very artist-friendly, allowing them to simply select the base mesh and having the script find all the appropriately named UCX_ objects, shifting them along with each mesh and exporting them. Copy the location, position and scale or selected objects to the clipboard using Unreal-friendly syntax allowing you to paste thousands of objects objects into your UE4 maps with a couple of clicks! NEW: Exports UCX collision geometry! Just ensure your naming is correct, and the script will detect the appropriate UCX primitives for export. Note: they do NOT need to be selected or visible! Fixed: Interface updates when the max file is loaded, saved or reset, showing the correct paths, etc. As always, if you have any suggestions for improvements, or bug fixes, please don't hesitate to let me know! I am french and use metric unit with meter in display and system unit. Objects export fine but when copy/paste I'd need to multiply by 100. I think you should add a parameter both in export and copy/paste so we can adjust scale as we need. That's certainly possible. I have some functionality in other scripts that automatically adjust everything based on the specified system scale in MAX. Are you suggesting the script scale the exported objects so that your 1m x 1m x .5m cube becomes 100 x 100 x 50 upon export, then also scaling the positions by 100x as well, so that you can keep your MAX scene in 1m scale while importing everything into UE4 at 1uu == 1cm scale? I think that would certainly be helpful for a lot of people. Look for it in the 1.2 release! Yes, I think it would be very cool to have this option, and to be the more helpfull for a lot of people (with more strange units than me) a custom value that could be stored as a default. Hello. In my workflow I export my objects in sub-folders based on the Max layer I have put them in. Could it be possible for 1.2 to have the option to export the selected objects in sub-folders within the selected export path based on the layer they were in in Max, and have the Meshes correspond to the exported object rather than the default Cube one. This would save me a huge amount of time when dealing large, already built scenes that are already ready to be exported. Hi, I'm currently facing the same problem from Harold. I'm using meters and i have some issues with the import settings in UE4. However, when i import some files in Unreal, il will downscale them to 1/100 from his size, so i need to put a x100 multiplicator in the Import Window. However, when i need to re-import a file, it will randomly apply the x100 multiplicator left on the mesh settings, And if I put it back to x1, it will this time randomly apply a x-100 multiplicator on the file. So we need to juggle on this settings, trying to have the good import. Despite of that, it is an awesome plugin and still a time saver ! Hi! Cool tool! But have litle truble. What a great script! It really saves time! However i asgree it really needs some sort of unit scaling. With more and more people using unreal for archviz, working in specific units is a big thing. Please if you have time it would be a feature id love to see in 1.2! Thanks so much for this! I just downloaded it last night and it is a great time saver. One thing I noticed is that the fbx unit adjustment only works when you export 1 object at a time. Using max 2016 here probably will be reverting back to an older edition though. I have max units set to CM to coordinates with Unreal. I think that's the problem. your script is taking generic units? I'll keep playing..
Any chance of integrating Lods into your script? Just as an FYI, the script caused inaccurate results in transforms and scale when using FBX2014 but once I changed it to FBX2013, All data was correct except for X rotated by 90 degree... no big deal to fix. I made sure that the system units were set to cm, but still had inaccurate results with FBX2014. Therefore I recommend using FBX2013 for this script if anyone is getting wrong transform data. I cant get this to launch in 2016. I've ran script, installed it in the plug in section, and even dragged and dropped it in max, nothing opens up, or appears. @Zombiexm: You probably need to find it through your UI customization. Go to your Custom User Interface, panel "Toolbars" and under "Category" dropdown you search for the entry TS_Tools. Now you can either create a new toolbar or placing the two tools into an existing. Works fine in Max 2016 here. @tomshannon: Wonderful tool! Atm, i have one question. I search for a way to replace nearly 300 dummy boxes (created with TS_Tools script) with the FBX assets i imported (exported with TS_Tools). Is there any hint where to start best? anyone know what we are doing wrong? 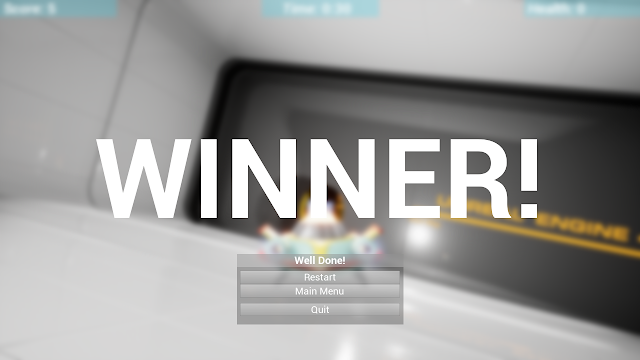 Also having issues with copying and pasting into UE4. I've tried several different methods, but can't seem to get the units to match when pasting. I'm working on archviz projects that use feet/inches. When i copy into ue it keeps these units and doesnt translate. I've tried converting the systems units and also display units and still no luck. Any suggestions?? I am having a problem, when I convert multiple files from Max 2016 and open the export path folder, there is only a file called 'Layer' with 0 bytes. But the folder properties show that it is taking 52MB on disk. When I re-export, it asks me if I want to re-write so I think the fbx files are being generated, but they are somehow hidden. Anyone else with this problem that can shed light? can you add LOD's export? I had the same problem, thanks for sharing the solution. Fantastic idea for a tool, I'm going to download and try it out tonight. Thanks so much for making this! Does it work with 2017? I drag it into toolbar section in Custom interface and doeasn work! It works with me on 3Ds Max 2018. How do you paste the location information into Unreal after copying it from your tool? I can't seem to find anything on how to do that. Ignore this. Restarting max fixed it. Weird. Can you please re-upload on dpox? Any chance the script is available again? It seemed to be a really handy tool to have. Hey I reset my computer and am looking to download this plugin again. There is no file at the Dropbox link. can you either please upload it or send it through to me. I need it urgently thanks. I love the plugin. soo good. Although I have been using the older one up until now. 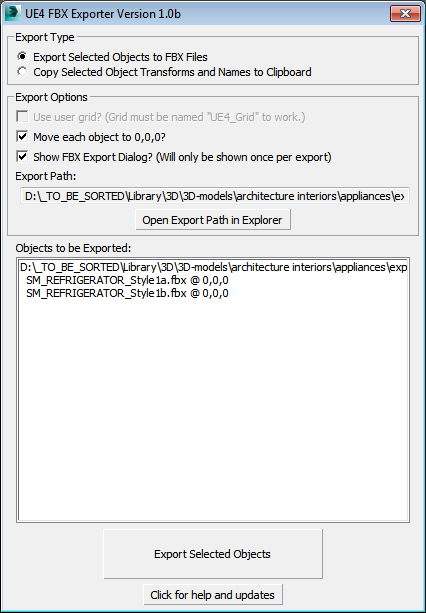 Why can you no longer specify where you would like to export the FBX files to? It seems to only be exported to the origin of the 3ds max file. is there a way to direct the export to a specific folder? The plugin is fantastic, would there be any possibility to migrate it to pyton to be able to use it in blender? FIX THE ROTATION PLEASEEE!... ANY SOLUTION? WHEN AN OBJECT IS COPYED!!! Has there been any fix to the rotation issue when copying object into UE4? It copies the location and scale fine, but it can't seem to rotate the objects to the right position. I was curious if there was any workaround to this? Hi, I love this script! Its much faster than the old one I used. However, I noticed that when copying positions to a clipboard, the more objects I have in the scene, the time it takes to copy increases exponentially not linearly. So if I copied 100 objects, it might take 10 seconds, but if I copy 200 objects it would take 30 seconds, etc..
Been using this a while now and it's a fantastic timesaver. If you updated with a few bug fixes(described above) you could stick it on Gumroad. I would gladly throw $10 your way.